The ASME Impact Test Requirement article provides you with information about impact test requirements in pressure vessel design and construction. 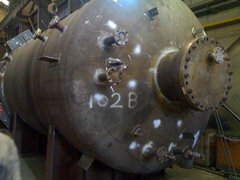 Let's say, you have a pressure vessel under design, process and construction has not started yet. Based on the ASME impact test requirement, you need to make assessment to see that either your pressure vessel is exempted from impact testing, or you need to carry out the test. There are 4 steps for impact test exemption assessment. You need to know these steps. You might be exempted in the first, second or third steps and might not be exempted even in step 4. So if you are in step 4 and you have not exempted, then you need to carry out the test. I will explain the process for exemption in this article. You may know carbon steels and low alloy steels exhibit a drastic change in their room temperature ductility at sub-zero service temperatures. Different types of materials exhibit different types of transition behavior. We can see there is a sudden, phenomenal drop in their notch-toughness properties below the "transition" range of temperature, which should be a matter of concern for us. Body centered cubic or Ferritic alloys exhibit a significant transition in behavior when impact tested over a range of temperatures. Above transition temperature range, impact specimens fracture in a "ductile" manner, absorbing relatively large amounts of energy. At lower temperatures, i.e. below the transition temperature range, the impact test specimens are found to fracture in a brittle (cleavage) manner, absorbing less energy. And within the transition temperature range, the fracture is a mixture of ductile and brittle nature. A material would be invulnerable to a sudden drop in notch-toughness at the lowest specified service (or design) temperature, if it is proved by conducting Charpy V-notch Impact tests on representative test samples, at reference (the lowest service) temperature. Grain refined carbon steel forgings and wrought materials (thoroughly worked and normalized) generally exhibit good notch toughness. There are specific rules in ASME Code for exemption from ASME Impact Test Requirement. This test is very expensive, so pressure vessel manufacturers are trying to be exempted for this costly test. First you have to keep your pressure vessel design data available and then refer to UG-20 (f). If you are exempted from this clause, you do not need proceed further. But if you are not exempted by UG-20 (f), you have to proceed to UCS-66(a), but again if you are exempted, there is no need for more assessment. But if not, you have to proceed to UCS-66(b). If you are exempted now, there is no need for more assessment; otherwise, you have to proceed to UCS-68(c), and again if you are still not exempted, you have to carry out impact testing. For some cases, You might be exempted from the ASME impact test requirement in the first stage in UG-20 (f). In others, You might be exempted in UCS-66(a) or UCS-66(b) or UCS-68(c). If you are not exempted, you must prepare yourself for doing this costly test. This test would be more costly out of the US because of Laboratory Accreditation requirements. Also, there are fewer accredited labs in Europe and the Middle East, and their price is high as well. We will start with UG-20(f) for the ASME impact test requirement. If your MOC (Material of Construction) is categorized in P-No. 1 or 2 (Refer to ASME Code Section IX for P-No Definition) and your MOC thickness has the limited value defined in this clause, then you might be exempted from impact testing. But you need to refer to Fig UCS-66 in ASME Code Section VIII Div 1 and see in which A, B, C or D curves your MOC is listed. All ASME carbon steel and low alloy steel material is distributed in these 4 groups (Curves) of materials. 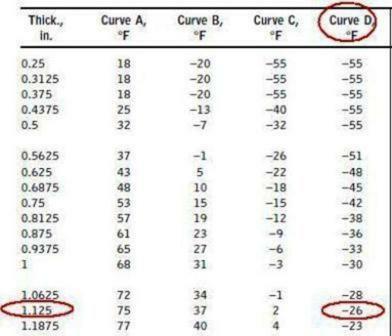 You need to know that the materials listed in curve D have the best toughness property, better than the materials listed in curve C. Similarly materials listed in curve C have better toughness properties compared to materials listed in curve B and materials listed in Curve B have better toughness than materials listed in Curve A . When you determine your MOC curve, then you have to review UG-20(f) and look for the possibility of exemption from the ASME impact test requirement. There are some other conditions in this clause, which you should consider for exemption. For instance, the vessel should be hydrostatically tested after completion, and the thermal and mechanical loading can not be a design controlling factor. For example, if your MOC is a normalized SA 516 Gr.70 with 0.75 inch thickness you will be exempted from ASME impact test requirement. Your thickness, in this example, is 0.75 of an inch, and is listed in curve D which is up to 1 inch, you are exempted by this clause. Of course, you will be carry out hydro-static test and ensure that the mentioned loadings are not a design controlling factor in your considered pressure vessel. But for assessment, based on this clause, you need to know your pressure vessel MDMT (Minimum Design Metal Temperature). Assume that is -20 degree F, so you should now go to Fig. UCS-66 and locate 1.125 inch in the horizontal axis and draw a vertical line. In a similar way, locate -20 degree F in the vertical axes and draw a horizontal line. These two lines will cross each other. See above Figure, the lines are identified in red. 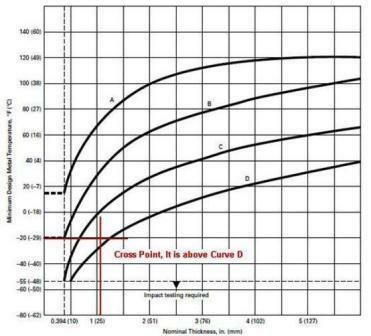 If the cross point falls above the curve D (because your MOC is listed in curve D) you are exempted. Otherwise you are not, but for the current example, you are above the curve D so you are exempted from impact testing. To simplify your assessment for the ASME impact test requirement, the Fig-66 has been converted to the table(table UCS-66). For any MOC with specific thickness you can go to this table and see what is the minimum permissible temperature without impact testing. Then go to the Figure UCS-66(b) and in the vertical axes locate Ratio and draw a horizontal line. Then locate the cross point with the graph and draw a vertical line to cross the horizontal axis. You will be able to reach a value of 8 in the horizontal axes. This 8, is your 8 degree F bonus from table UCS-66, which you can reduce by 8 degrees F minimum permissible temperature in table without impact testing. In the above example, your MDMT is -27 degree F, and in the UCS 66 table, the minimum permissible temperature without impact testing designated -26 degree F. So with this clause you can reduce it to -36 degree F(-26 -8 = -34). Your MDMT is -27 degree F, so you are exempted from impact testing with this clause. This is because the minimum permissible temperature is -36 degree F, but your MDMT is -45 degree F, so UCS-68(c) might be helpful. 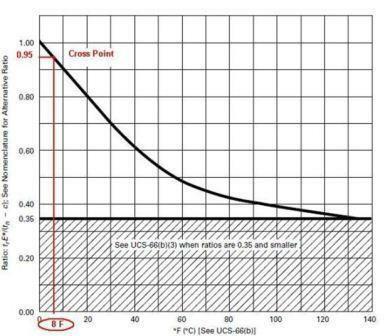 It says that if post weld heat treatment is not a code requirement and your P-No is 1 and you carry out post weld heat treatment, a 30 degree F bonus will be granted to you to reduce the minimum permissible temperature in table UCS-66. So when post weld heat treatment is code requirement? So, for our example, our service is not lethal and our P-No. is 1 and thickness is 1.125 and it is less than 1.5 inch: therefore, post weld heat treatment is not code requirement. It means if you carry out post heat treatment, a 30 degree F bonus will be granted by this clause. For this example our minimum permissible temperature would be -36-30=-66 degree F, and your MDMT is -45 degree F, so you are exempted from impact testing. Now the worst case: in the above, assume you need to have -70 degree F for your MDMT; you can see with this new condition you cannot be exempted even by UCS-68(c) and you have to carry out impact testing.